Launch of a Unique BREATHWORK classes that balance and change your mental, emotional and physical state. Through series of breath flows, bring more Oxygen into your body, gain a sense of Calm focus and increase your Energy. Awaken your senses and leave on a high like no other. Join us to harness the power of your breath. No wonder, BREATH is now embraced by everyone, from City executives to athletes, interested in improving their health, wellbeing and performance in all aspects of life. You will leave with not only with sense of relaxation and connection to your body but also with sense of empowerment. Learn and develop new set of skills and highly effective Breathwork practices that you can use at work (yes, even in the office) and in all aspects of your life. 1st 2 Classes for £25 (instead of £15 per class). No equipment needed. Yoga mats and blankets will be provided. Please wear loose, comfortable and warm clothes. We also suggest bringing a bottle of water with you. 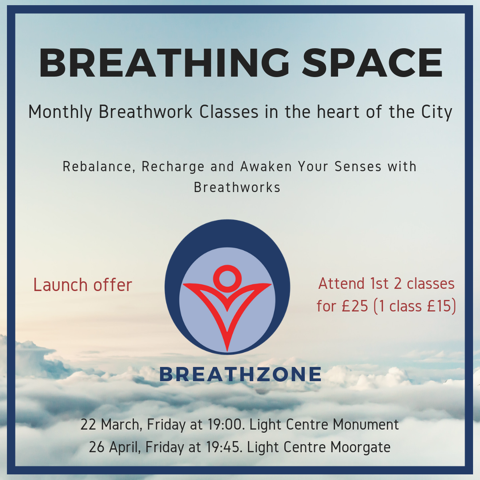 These classes are suitable for newcomers to Breathworks as well as experienced breathers alike. These classes are not part of ‘Light Centre Monthly Pass’. Melike is a Conscious Mindful Breathing Coach and Certified Transformational Breath® Workshop Leader having trained with modern breath-work masters around the world. She is the founder of Breathzone, a company dedicated to sharing the empowering and transformational possibilities of Breath-work. With over 15 years of experience in senior finance roles in technology companies and consultancies, Melike understands the importance of finding fast and effective tools that individuals can proactively use – to manage their stress, anxieties and other life’s challenges – especially in the workplace as well as in all aspects of their lives. Melike’s own experiences with Breath-works have completely shifted her life. With the effectiveness and ease of breath work practices she developed over the years, Melike helps uncover potential of human beings when they know how to connect to their own resources. She is extremely passionate about sharing his powerful practise to help others thrive. Melike has a unique, science-based approach in her coaching, based on the latest research in neuroscience and psychology, empowering her clients for long-lasting change. She offers bespoke breath work based programmes designed to help her clients de-stress, re-balance, and boost creativity and performance by learning to tap into the natural power of Breathing. She works with individuals, institutions and businesses enabling them to reach their full potential. Our private sessions, workshops and events help improve focus, creativity and performance, increase energy, confidence, alleviate stress, anxiety, enable calm and relaxation.